Blurb : In only three days, Sealord Drac will unveil the lighthouse known throughout Freeport as Milton's Folly. It's a race against time, as the PC's must discover the hideous purpose of Drae's creation before it is too late. Will the Brotherhood of the Yellow Sign summon forth the Unspeakable One once again, and send Freeport to a watery grave? Will Milton Drae turn himself into a dread god, and harrow the world with his malefic power? Or is the Sealord just a dupe of the Brotherhood, to be sacrificed for the greater evil of the Yellow Sign? These rumors and many more are whispered on the streets of Freeport, while foreign ships by the hundred sail into port for the lighthouse's debut. 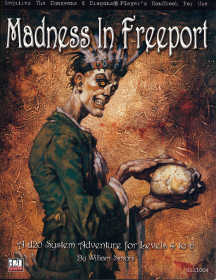 Madness In Freeport is the action-packed conclusion of the Freeport Trilogy. The citys fate hangs in the balance, and only swift and heroic action by the PC's can foil Drac's sinister plan. Freeport will never be the same.